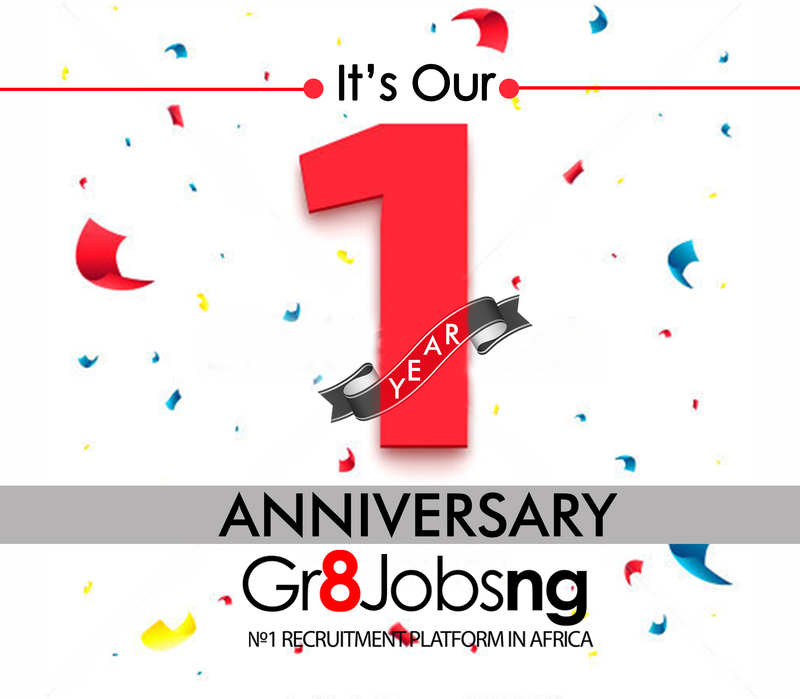 We are pleased to announce the first year anniversary of the Gr8jobsng recruitment and HR services platform www.gr8jobsng.com The first of its kind in Nigeria and Africa, the Gr8jobsng brand powered by U-Connect Human Resources Limited was launched on the 29th of June 2016 at the Oriental Hotel in Lagos and handles the full range of HR services for Jobseekers, Professional, Employers and Training Institutions. We say a big thank you to all our users and partners who have been a part of our journey thus far and who have joined us in reducing the unemployment rate in Nigeria. It's been a tough, fruitful and highly rewarding year and we have just begun!!! We began as all newborns do, with nothing! And in this past year alone, we are proud to say that we have over 500,000 Jobseekers and 2000 employers registered on our platform. We have also filled over 5,000 vacancies and re-written over 1500 CV's for jobseekers nationwide! We have also formed strategic alliances with such great brands as Microsoft Nigeria, Lagos Business School, Ernst & Young and Nigerian Breweries to bring to life great initiatives like "Recruitment day" and "project employ" which are two of the numerous original initiatives we have developed to help the unemployed or underemployed of Nigeria find great placements. Also within these past 12 months, we have organized and executed over 15 career events and employability trainings to help educate the public on the necessary knowledge and skills required to succeed in their careers. And to cap it all off, we have launched our two newest initiatives in celebration of our 1st Anniversary, the Gr8jobsng Campus Ambassador Programme to help young undergraduates begin to develop the right skills for the corporate world in order to kick start their careers and the Gr8jobsng employability Centers an initiative that brings the services of Gr8jobsng to different neighborhoods in Lagos as a first step to ensuring the right skills are accessible in every area of Nigeria. We know we have not scratched the surface yet in solving the HR problems for both SME and large corporate businesses in Nigeria and as such we will continue to bring innovative initiatives and services to our valued clientele. Through our numerous Employability events, we also plan to drastically reduce the rate of unemployment in Nigeria as we plan to upscale our initiatives. Thank you once again for being part of our success story, it has been a year of achievements and continuous learning. We look forward to launching new and exciting initiatives in our service delivery this coming year, as we offer more value to all our user groups. We will continue to bridge the gap between Job Seekers and Employers through the exciting new initiatives we have launched and will be launching within the next year. We wish all our users a successful year ahead and we encourage you all to continue to utilize our premium services on the platform. For our Job seekers: Video CV upload, Pre-assessment Tests, Job Alerts, Priority Listing, Invitation to Employability Skills Training Seminars, Career Fairs and more. For our Employers avail yourself of our Verification, Recruitment, Training, Hr consulting,Free posting of jobs, Outsourcing, Staff management and many more.